The transition from traditional marketing to inbound marks a paradigm shift in the business world and it’s therefore easy to understand why many property companies fall foul of some of these common pitfalls. To help you sidestep these, below we’ve looked at some of the most typical mistakes made by newcomers and the best ways to prevent or fix such situations. Many time-strapped individuals acknowledge the need for marketing and even content, but take an ad-hoc approach to this due to understandable time constraints. In the worst case scenarios, you can end up with several areas of the business all producing their own content in a variety of formats with no particular end goal in mind, nor a clear idea of how it will benefit the company’s marketing efforts. Producing content from guilt or as a box-ticking activity will be ineffective at best and at worst, will paint your organisation in a bad light. The Fix: Having some content is arguably better than putting out nothing at all, however, poor-quality or dense content can actually negatively impact your firm’s online profile. Gearing your organisation toward content production needs the commitment of both management and wider staff. Incentivise content production: reward the authors of the best performing assets and trumpet online successes to the business as a whole. Create an editorial calendar: Set achievable goals in terms of what you’ll be able to put out, in what format and how often. Property companies typically have a strong grasp of current affairs in terms of what's happening in the property and construction market and this can be a fantastic asset in regard to producing relevant content. However, all too often we’ve seen firms produce a lacklustre end product - which comes across like a mix between an almanac and a game of acronym bingo. There’s an understandable desire for accuracy in such a regulation-driven sector, however, consumer or client-facing content needs to be friendly, digestible and genuinely engaging. The Fix: There’s two options in regard to this problem. The first of these is to roll out training on how to tailor content. Writing empathetic content that speaks to your readers isn’t something that’ll come overnight and it'll take a lot of work to get it spot-on. The second is to hire (or outsource) a sub-editor. As with the ‘subs’ in most major publications, this individual’s job is to keep all content readable and on-message. While a slightly less common problem, a number of companies that are actively producing content may - due to a lack of technical knowledge, taking bad advice or simply for ease - choose to hide their content away. This can be in the form of 'unindexable' (meaning it can’t be read by search engines) e-magazines or periodical newsletters, or simply publishing your content somewhere that isn’t your main site. The Fix: Consolidate your content. Attention spans are waning and no matter how pretty your quarterly magazines or newsletters are, most of the stuff you fill them with is likely to go unread. Instead of locking promising articles away until you’re ready to produce a magazine’s worth of content - post them one at a time as a blog or news post. This keeps your site refreshed with regular content, positively influencing search visibility and more importantly - gives your prospects something to return to you for. You needn’t throw away the newsletters or magazines either. Feel free to post snippets and links to the site-hosted content in your newsletter and re-use articles in e-magazine format or even in print. However, be mindful of duplicating content. While Google claims you shouldn’t be overly worried about this (unless you’re a spammer), there is some evidence to suggest this might negatively affect your site’s SEO. 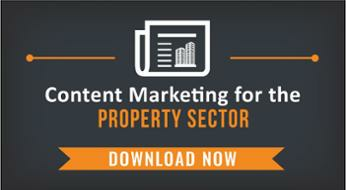 Many property firms are understandably risk-averse and this stance can often be reflected in their content. While it’d be easy to avoid courting controversy by sticking to ‘safe’ topics - this approach undermines one of the most important tenets of content marketing; being interesting. The Fix: Publishing news and content online comes with all the responsibility associated with traditional journalism, however this shouldn’t be a barrier. Property companies simply need to ensure that their in-house or out-sourced content team is either qualified or trained in media law. This will enable you to safely navigate the legal perils of publishing, without necessarily sticking to staid topics. Covering competitors’ activity is another issue that can prove tricky and many in the property sector opt to completely ignore their peers within content. However, this is unnecessarily restrictive and can be detrimental when you’re attempting to position yourself as a thought leader and key player in your field. The Fix: While it makes sense not to cover overly-promotional news from your competitors, don’t be afraid to talk about research they’ve produced or comment they’ve given on a subject. Clearly set out your expectations in this regard when you’re putting together your editorial brief and guidelines. Now that you’ve been introduced to the basics, it’s time to roll up your sleeves and get your hands dirty. But if you need any more tips on best practice, don’t hesitate to get in touch or fire us a tweet.